Certified nurse-midwives (CNMs) assist women preparing for pregnancies, assist with child delivery, and provide post-partum care. They work closely with certified midwives (CMs) to provide women with any type of help needed through the course of a pregnancy. Talented nurse-midwives can reduce reliance on modern medical interventions during the course of a woman's pregnancy, but most midwives understand when modern scientific procedures should be utilized. About 7% of American women prefer relying on midwives during childbirth, and nearly all midwife assisted births occur in hospitals. Although most people assume midwives only assist women during childbirth, they spend 90 percent of their time providing other services. They also assist women with reproductive health and post-menopause issues, offer advice about proper nutrition and physical activity during pregnancy, and refer women to gynecologists when necessary. Nurse-midwives are employed at companies offering home birth services, health clinics, gynecologic clinics, public health centers, hospitals, and many set up and manage private practices. They can be found in rural areas and big cities. Currently, demand exists for certified nurse-midwives in underserved and poor areas. Nurse mid-wives have the option of teaching, working in administrative positions, conducting research, lobbying policy makers, and working in clinical settings. Many nurse mid-wives work for non-profit organizations dedicated to improving women's health worldwide. Currently, there are 42 accredited nurse mid-wife training programs within the United States, including 39 graduate-level programs. After successful completion of a program, you can become licensed as a certified nurse-midwife by passing a certification examination. Nurse mid-wives interested in clinical practice must complete a graduate-level program. Most programs only admit registered nurses with bachelor's degree, while certain programs only admit students with bachelor's degrees in nursing (BSN). Graduates of nurse mid-wife training programs without bachelor's degrees in nursing will graduate as certified midwifes. Graduates holding bachelor's degrees in nursing will graduate as certified nurse-midwives. Certain programs permit students with associate's degrees to earn a bachelor's degree and complete a nurse mid-wife training program simultaneously. Admission to nurse mid-wife training programs is very competitive. Many nurse-midwives apply multiple times before being accepted. Many organizations only hire certified nurse-midwives who’ve completed graduate-level programs. Additionally, many states only license graduate-level trained nurse mid-wives. 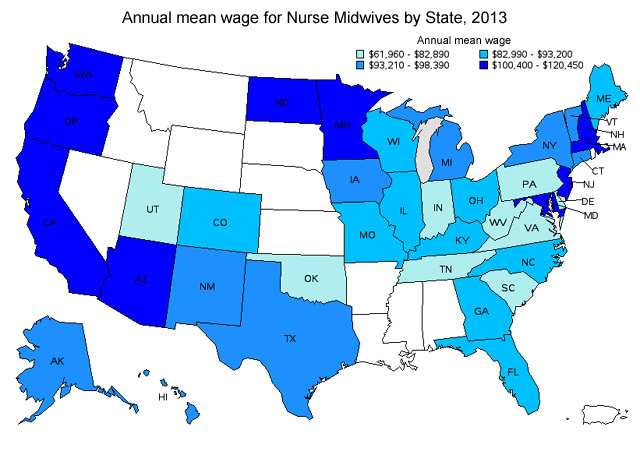 The following page shows the mean annual wage for nurse widewifes by state throughout the United States.